All Waitrose bacon comes from our dedicated British farmers. Bacon is made from fresh pork which has been cured (preserved with curing salts). It was originally preserved in this way so that it would keep longer. Bacon is either unsmoked or smoked. It’s smoked by hanging it on a rack in a smoking chamber. We use beech, oak and cherry wood to smoke our bacon and all the wood used for our smoking comes from sustainable sources. Good bacon starts with the way the pigs are reared, and we source all of our bacon from the same farms that supply our fresh pork. All Waitrose bacon can be traced back to the farm where it was reared. The meat is processed as a batch from farm to shelf so it's quality can be monitored throughout. essential Waitrose British bacon is expertly prepared using prime cuts of pork, then cured for flavour. essential bacon is wet-cured, meaning we cure the loins (for back bacon) and bellies (for streaky) using a water-based cure. essential Waitrose bacon comes from British outdoor-bred pigs and is sold pre-packed in all our branches. The range includes smoked and unsmoked back bacon and smoked and unsmoked streaky bacon. Gammon steaks come from the pork leg, by removing the hock, bones and topside muscle. Once the cure has been added they are placed into a casing that helps to hold the shape that we see once they are sliced. The gammons are left in the casings to cure to develop the flavour. All of Waitrose gammons are made naturally using whole muscles and are never made from reformed chopped and shaped meat. All of our gammon steaks are cured and smoked in the exactly the same way as our bacon. Dry curing is the traditional way of preserving pork by carefully rubbing sea salt into the meat by hand. The meat is then left to mature, before being sliced into rashers. Look out for our maple cure, which gives a deliciously sweet and smoky flavour. Free range bacon and gammon comes from pigs that are free to roam outdoors in paddocks their entire lives. They’ve got free access to straw-filled shelters, which keep them cool in the summer and warm in winter. The range includes back bacon and streaky bacon as well as gammon steaks and joints, and it’s all cured by hand with a sea salt-based cure. All of the bacon on all of our Service Meat Counters is Free Range. All our Duchy from Waitrose bacon is dry-cured then air-dried. Air-drying dates back to the 1890s and the traditions of those days are maintained to ensure that premium quality bacon is produced. A unique cure and sea salt is hand-rubbed into the meat, allowing it to naturally penetrate the pork. The product is then air-dried, which removes naturally occurring water, increases the flavour and delivers a seriously tasty rasher! Duchy from Waitrose bacon comes from 4 farms in Yorkshire and Norfolka, where the pigs are fed an organic diet and allowed to roam freely on land farmed to organic standards. The farms are regularly monitored by the relevant organic accreditation bodies. This combines quality bacon with a touch of Heston’s magic. Look out for Syrup & Stout Streaky Bacon Rashers and Alderwood Smoked Streaky Bacon rashers in the pre-packed bacon range. Gammon comes from the leg and is a versatile piece of meat which can be eaten both hot and cold, whether it’s in a sandwich or in a soup! 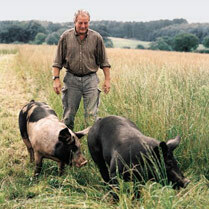 Roger Newton supplies pork for our free range bacon, from his Norfolk herd of Hampshire Breed pigs. "People say the Hampshire Breed pork and bacon has the flavour they remember from when they were young. It really is something special."